AMC announced today that the network is adding a third night of original programming with the Season 3 premiere of Hell on Wheels debuting Sat., Aug. 3 at 9/8c. Executive produced by showrunner John Wirth (Terminator: The Sarah Connor Chronicles, Falling Skies, The Cape), Mark Richard and Jeremy Gold, Head of Creative Affairs and Endemol Studios starring Anson Mount, Colm Meaney, and Common, Season 3 of Hell on Wheels lands in the year 1867, the third year of the building of the transcontinental railroad. Cullen Bohannon leaves his vengeance-seeking behind and invests in the new American landscape…the beginnings of big business, big religion, and the new role of Wall Street in the White House. Bohannon must contend with racism, greed and murder as he single-mindedly leads the Union Pacific in its race across the country against the Central Pacific Railroad. The high stakes corporate race, the environmental costs and degradation of the native peoples’ way of life are themes that resonate deeply in today’s America.For over a decade of Saturdays, AMC has celebrated the American Western genre through a mix of series and movies. Today, AMC adds to its inventory a selection of classic films from Paramount Pictures to super-serve the Western fan including El Dorado (1967), The Man Who Shot Liberty Valance (1962), The Shootist (1976) and The Sons of Katie Elder (1965). The network will also celebrate the anniversaries of several renowned Westerns including the 60th anniversary of Hondo (1953) and the 50th anniversary of McLintock! (1963), both starring John Wayne, as well as the 45th anniversary of Hang ’em High (1968) and the 40th anniversary of High Plains Drifter (1973), both starring Clint Eastwood. These films will join the classics includingChisum (1970), The Cowboys (1972), Rio Bravo (1959), The Alamo (1960), The Undefeated(1969), Joe Kidd (1972), A Fistful of Dollars (1964), For a Few Dollars More (1965) and The Good the Bad and the Ugly (1966), which are already licensed by AMC. Moreover, the network has also acquired the television series, Rawhide, starring Clint Eastwood, which joins Riflemanbeginning Sat., Apr. 20. Additionally the network will air the miniseries Lonesome Dove and, for the very first time on AMC, its sequel, Return to Lonesome Dove. 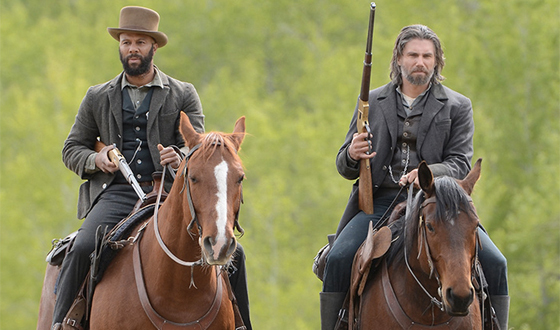 Hell on Wheels was the second highest series launch in AMC history and was also a top 20 program for engagement among age 25-54 (IAG) for the broadcast season for 2011-2012. The series’ second season wrapped in October 2012 with an average of 2.4 million total viewers and 3.2 million viewers with Live plus 7. Hell on Wheels was developed by Endemol USA. The series is produced by leading independent studio, Entertainment One (eOne) and Nomadic Pictures. eOne’s Television CEO John Morayniss and EVP US scripted television Michael Rosenberg oversee production in partnership with co-producers Mike Frislev and Chad Oakes from Nomadic Pictures. Through an international distribution partnership, Endemol USA held television distribution rights for the series across Europe and Entertainment One handled rights in all remaining territories as well as worldwide rights for DVD/Blu-ray, VOD and Digital distribution. For more information, visit AMC’s press website: www.press.amctv.com. Nice that the western seems to be coming back. I’m just about over the top with cops and crime shows. This series has proven surprisingly good. I feared that no one would watch it, We’ve seen several good shows fail despite critical excellence.